On 24th August 1914 the editor of ‘Poultry World’ proposed a national scheme that had been an annual event for the magazine for a few years and called ‘Hospital Egg Week’. The theory was that eggs were so nutritious they were ideal for sick people. The eggs collected were given to hospitals in London. 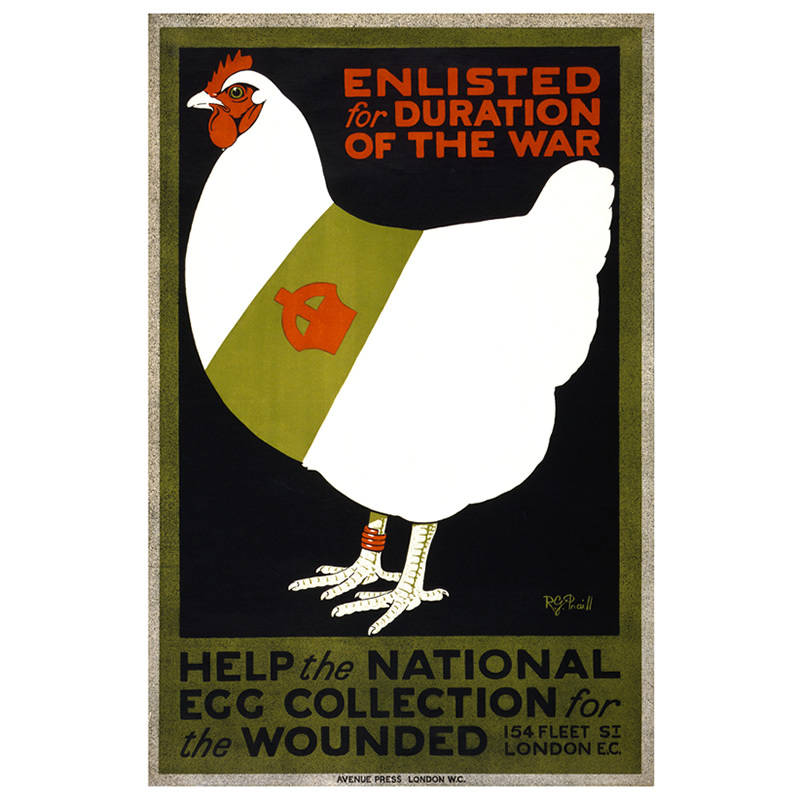 The War scheme became known as the ‘National Egg Collection for the Wounded’ with a slogan ‘Every Hen should be on Active Service’! 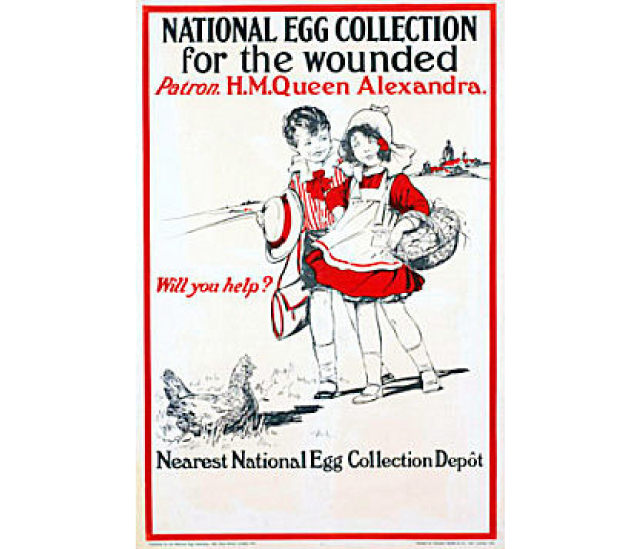 The eggs, once collected would be sent to hospitals in France and Flanders where the wounded were treated. The initial target was for 20,000 eggs a week and the system worked by local people collecting eggs from the hen keepers that could be large scale, or just folk with a few chickens to supply the house. Some gave one or two, and some a percentage. Very quickly returnable egg boxes were issued to transport the eggs and the railway companies provided free freight. The headquarters was the offices of the magazine at 154, Fleet Street in London. A little later Harrod’s provide a London central depot at Great Queen Street WC2. Very quickly the scheme seemed to have been taken up by children going around and collecting the eggs from the farms and small holders. The first mention of the scheme in our area comes in early 1915 with the news that the Salvation Army had set up 60 depots and that the target had been increased to 200,000 a week. By March there were 500 depots nationwide including Hull, Winestead and Patrington. As well as being sent to the national scheme some were sent direct to local hospitals, for example Halsham, where in June 1915 180 eggs were sent to the NEC and 270 to Hull Infirmary. The first mention of a depot in Hedon is June 1915 but it must have been running for a while as between 8th June and 20th July they had collected 4899 eggs. Hedon contributed 2080. Others villages using Hedon depot were Burstwick and Ryehill 725, Preston 639, Thorngumbald 587, Elsternwick 445, Sproatley 240 and Keyingham 36! In August 1915 Queen Alexandra agreed to become the patron of the scheme and to celebrate a target of one million eggs collected in a week was set. This was quite a task when it is seen that since November 1914 8 million had been collected. However in the week 16th to 23rd August 1,036,380 eggs were collected, and this total did not include many thousands that were given direct to local hospitals. 570 of this total were collected at the annual Children’s treat held in Hedon that week. From the start of the scheme people were encouraged to write messages and addresses of the senders on the eggs and there were reports of letters being received back from the wounded on the continent. A Miss King of the Boulevard in Hedon from a soldier in France. During Easter Week 1916 1,426,310 were donated and by August that year the grand total was 22 million! Meanwhile between Jul and September the Hedon depot had forwarded 3476 of which Hedon contributed 1496 and between September and December the figures were 3313 and 1019. Since the Hedon depot had got up and running 33062 eggs had been sent onward for the wounded. By comparison Driffield had sent on 150,000 in the same period. It was stated that in July 1917 every wounded soldier and sailor in France was supplied with eggs. However the numbers were never to achieve the numbers of previous years as the war started to bite on food production at home. Feed for the hens became expensive so less hens were kept and more were retained for home consumption. Coupled with this was the fact that heavy fighting increased the demand for them from the wounded. For example at Driffield in a week in 1916 they collected 900 eggs but in the corresponding week in 1917 only 30 or 40 were donated. To try to stimulate donations again a flag day was held in Hull on 17th November 1917 and it was decided that badges would be presented to those who had worked hardest for the scheme and were recommended by the depot controllers. Food was becoming so short that many orders were given by the Government including the Egg (Restriction) order in February 1918 that meant that eggs could only be used for human consumption or for breeding. Even so by September 1918 2100 depots had managed to collect 40 million eggs and money to purchase them. All those that gave eggs were given a printed address signed by Field Marshall Sir Douglas Haig KT, GCB, GCVO, KCIE, Commander in Chief of British Armies in France on ‘Autographed Egg Week’! The Armistice was signed on 11th November 1918 but the scheme continued until April 1919 when it started to wind down. By which time the Winestead depot had sent over 60,000 eggs for the wounded and Hornsea 65,379 and £36 17s cash. Peace Day was organised for 19th July 1919 when every city town and village had some sort of celebration and those that had been involved in the National Egg Collection for the Wounded stood to in the many parades and proudly marched knowing that they had done their bit.